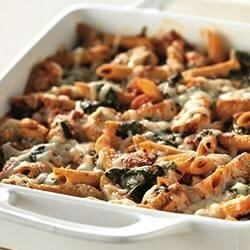 "Chunks of chicken in a creamy tomato sauce with basil and fresh spinach are baked with multi-grain penne pasta and topped with cheese." Meanwhile, cook and stir chicken and basil in large nonstick skillet sprayed with cooking spray on medium-high heat 3 min. Stir in tomatoes and spaghetti sauce; bring to boil. Simmer on low heat 3 min. or until chicken is done, stirring occasionally. Stir in Neufchatel. Drain pasta mixture; return to pan. Stir in chicken mixture and 1/2 cup mozzarella; pour into 2-qt. casserole sprayed with cooking spray. If watching sodium, prepare using no-salt-added diced tomatoes and lower-sodium spaghetti sauce. Substitute an 8-inch square baking dish for the 2-qt. casserole. Serve with CRYSTAL LIGHT Iced Tea. This was good, but not great. We ate it, I would make again for a change of pace, but would not add it to the regular rotation.